Made of Stone is a unique blend of mysticism, fantasy, and romance. Did you start writing with this in mind or did this happen organically while writing? It was always my plan to include these aspects. The story was “given” to me you might say. I was struck with inspiration for the story in a dream and as I begun researching the pieces unfolded. I never envisioned myself as a writer and certainly not a fiction writer; however, Satori Stones entire series is already laid out for me. The outline for the series and a Young Adult series that follows Sarah after this one has already been completed. I enjoyed the depth of Satori’s character and inner reflections that I could relate to. What were some sources of inspiration for her character? We write what we know, as they say. It was very easy to write Satori I just thought of how I might think or feel in a similar situation. I have heard from several people how they have found her easily relatable; so, I also think that I tapped into an underpinning of collective female consciousness. You use mysticism throughout the book to bring mystery and intrigue but also give Satori her powers. What draws you to this theme in the book? My belief and hope are by the end of the series readers will grasp the concept that they too have the ability to manifest their own destiny. A mystic is someone who has honed this power and worked toward it for years, however, we all have it dormant inside us. We have forgotten how to use our natural energies. Mystics are throughout history in every religion and with no religion. They aren’t tied to a certain dogma. They are universally accepted. This is book one in the Satori Stone Series. Where will book two take Satori and when will it be available? In book one she was being given Naoma’s powers as a surrogate. In book two, she will need to learn how to use the powers herself. She will discover she is a natural and most importantly, why, when she discovers who her parents are. The stakes get even higher as Satori and Sarah both are in harm’s way. The true villain is finally revealed and at least one person will not make it through this book alive. 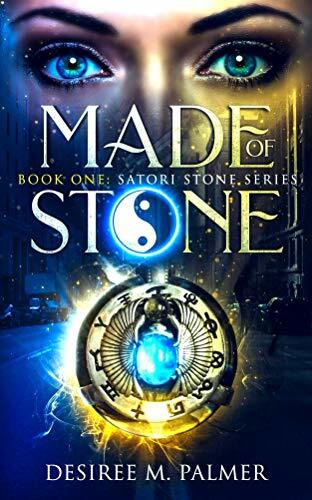 Made of Stone introduces readers to Desiree Palmer’s first fictional creation, Satori Stone. She is a carefree and witty single mother living in the Midwest. She embarks, unwillingly, on mystical journey being torn between good and evil. Her world begins to spin out of control when she goes home to visit her mother for Christmas. Her quirky neighbor Naoma and a stranger she meets along the way quickly turn into her new life support system. She will face a decision to accept her new fate and learn to use her natural powers or lose her family forever. Will she decide in time? There are women of mystery, and then there’s Satori Stone. Satori is, in all truth, a mystery to herself. When she makes preparations to pack and sell her mother’s belongings following her death, Satori discovers she isn’t who her mother always made her believe she was. As the days go by, Satori is hit with a new relationship–the relationship she has always wanted–and a realization about her own abilities. Soon after the revelation of her own identity, Satori finds her life and that of her daughter, Sarah, threatened by a force she does not recognize. With the help of her friend and mentor, Naoma, Satori learns quickly who she truly is and how to control the gift she never knew she possessed. Made of Stone, by Desiree Palmer, is a truly unique blend of mysticism, fantasy, and romance. Main character, Satori Stone, is thoughtful and introspective and has all the makings of a stand-out figure for a series. Palmer has begun, with this book, what promises to be a string of books in which readers will be afforded the opportunity to watch Satori grow and prosper in her newly discovered skills. Satori’s reactions are genuine throughout the book. Palmer writes in a real and raw manner of the heart-wrenching moment when Satori discovers the truth about her parentage. In addition, Satori’s emotional crisis on the plane with what could be the man of her dreams reflects every woman’s self talk and contains highly relatable moments of nervousness and apprehension. The friendship Satori has with Naoma is unique and enviable. The two are as much family as they are friends, and Palmer does a nice job of dragging out Naoma’s connection to mysticism. Even though I had some notions early on about Naoma, I appreciated the slow reveal of Naoma’s truth and, subsequently, Satori’s truth. As this is the first book in a series, I am looking forward to seeing the full story on Darvey, Satori’s new love interest. He intrigues me. Palmer has successfully created a character who could easily, down the road, be a hero or a villain. As much as Satori wants him to be the answer to her prayers, I wanted to see a hidden truth in his actions and his questions. He stands as an enigma and, for me, really makes the story more fascinating. The whole aspect of mysticism is captivating. Naoma’s explanation of the power within oneself is eye-opening. Palmer definitely builds a case for the mystics of the world with the character of Naoma. She, aside from Darvey, is my favorite character in the series thus far. I didn’t like the speed with which Satori is forced to use her abilities. As the first part of the book has a much slower pace leading up to the reveal of powers, I would like to have seen Satori struggle a bit more to get a grasp on her newfound skills. It felt to me as if the pace picked up quickly and some opportunities for character development were missed. All in all, Made of Stone is a fun read with a compelling story line and memorable characters.